As well as the Spokane Chiefs have played on the road in the first two rounds of the WHL playoffs, it’s always nice to return home. And the streaking Chiefs – now 4-0 in road playoff games – have a chance to put the Everett Silvertips on the brink of elimination when the teams meet at the Spokane Arena on Wednesday night at 7. Spokane, winners of six of its last seven and 16 of 19 games, holds a commanding 2-0 lead in the best-of-seven, second-round series, with the next two games – and a third, if necessary – against the Silvertips scheduled for the Arena. 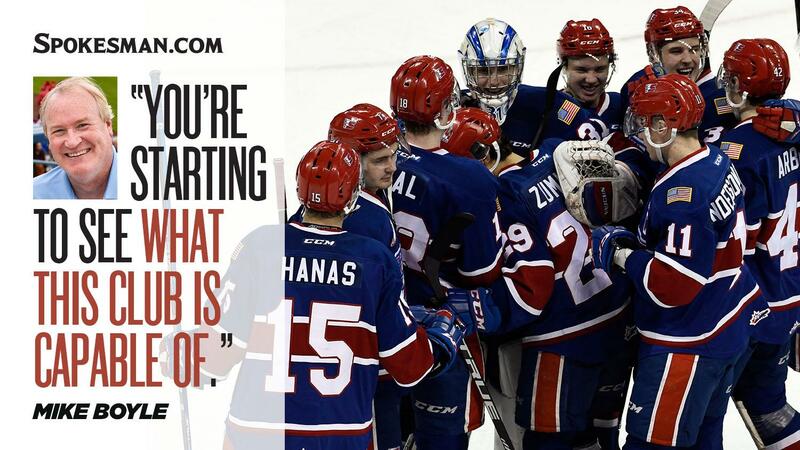 On Tuesday, Boyle joined Larry Weir to talk all things Chiefs, from the early season poll that had Spokane ranked No. 2 in the Canadian Hockey League, to the series-opening wins over Everett and what to expect in Wednesday’s clash with the Silvertips. “I think it’s easy to forget this club was highly regarded going in. Now that the club has had the lineup that they envisioned going into the season, you’re starting to see what this club is capable of. It’s nice to see that the lightbulb is turned on with this team as to what it needs to be to be successful and it starts with being a defensive-first hockey team. Published: April 9, 2019, 5:05 p.m.